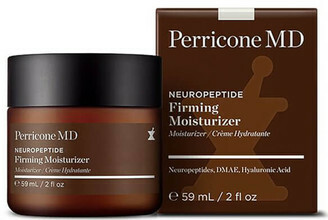 Fight the signs of ageing with Perricone MD Neuropeptide Firming Moisturizer , a luxurious cream that reveals youthful skin. A powerful blend of DMAE and Neuropeptides works to replenish hydration deep below the surface level, helping to firm and tone the facial contours and minimise sagging. The formula also helps to reduce the appearance of enlarged pores, discolouration and wrinkles, leading to a brighter, softer and younger-looking complexion.